Interiority is a much-discussed concept in the interior discipline. In its most basic form, interiority can be described as a sense of interior-‘ness’ freed from the constraints of architectural forms. The philosophical theses of interiority, which concern self-reflection and inner awareness, reveal it as an important idea for a discipline that is concerned as much with the physical properties of space as with the psychological impact of those spaces. Interiority is also valuable when attempting to understand building traditions in which interior spaces are articulated differently to those within the western European architectural tradition, such as in the case of classical1 Australian Indigenous buildings. As part of a Ph.D thesis titled ‘South-East Australian Indigenous Space and its Cosmological Origins’, interiority proved an important aspect of the research. This paper will delve into how interiority was framed for the research, and how interiority was understood in relation to a specific cosmological model. Firstly, this paper will conceptually equate interiority with liminality and propose that liminality provides an important mechanism for engaging with the shifting nature of interiority. 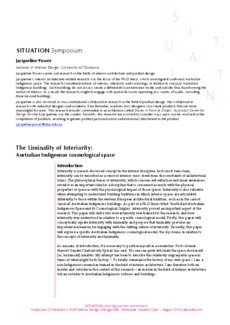 Secondly, this paper will explore a specific Australian Indigenous cosmological model, the sky-dome, in relation to the concepts of interiority and liminality. As a means of introduction, it is necessary to position myself as a researcher. Post-colonial theorist Gayatri Chakravorty Spivak has said, ‘No one can quite articulate the space she herself [or, he himself] inhabits. My attempt has been to describe this relatively ungraspable space in terms of what might be its history.’ To briefly summarise the history of my own space – I am a non-­‐‑Indigenous researcher trained in the field of interior architecture. I am therefore both an insider and outsider in the context of this research – an insider in the field of interior architecture but an outsider to Australian Indigenous cultures and buildings.